PINK HOLE is an international visual art project, merging dance, photography and live music. The work takes its point of departure in images by the Japanese photographer Nobuyoshi Araki. It focuses on the pornographic exposure of women and flesh. The stage is a boxing ring (8 x 8 m.) framed by Nobuyoshi Araki’s images projected on the surrounding four walls. The ring is used as a musical instrument by the two Japanese post-punk musicians, Yoshida Tatsuya and Sasaki Hisashi, RUINS. Inside the ring, exhibitionistic tendencies, emotional bluntness and sexual battles are exposed and expressed in a complex yet humoristic manner. The performance is a powerful, absurd and obscene comment on our time’s presentation of the female. 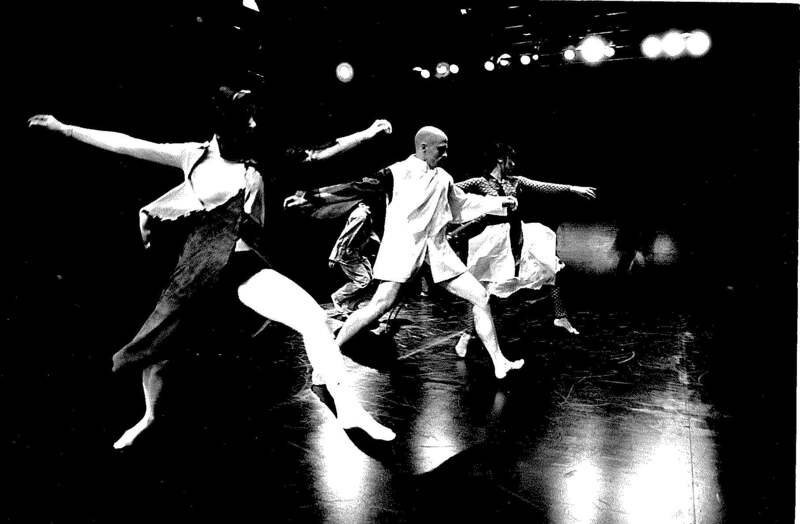 The dancers and musicians are closely interacting and the audience can freely move around the arena, as in a museum or gallery. "This performance is Sara Gebran’s brake through… PINK HOLE is as much an exhibition, a concert and as it is a performance…"
Supported by the Danish Theater Council under the Danish Minister of Cultural Affairs, Copenhagen International Theater (KIT), The Danish Actors Association, The City of Copenhagen Cultural Department, Danish Art Foundation and Foundation for Developmental Work.